That is the sound my brain is making/has made these past few weeks. Just yesterday I was convinced that it was Monday, the 25th! What's up with that? I missed not just a day but many days. I think it has something to do with my husband having taken a vacation day on Monday so that we could go to an amusement park. It's messed up my time clock. I'm relieved to know that I still have approximately 2 weeks to putter around (panic) before school begins again. Maybe things would go better if I had drunk (or drank?) a coke? and mozzarella in the very near future. And on an interesting note: NEVER place a bag of unopened marshmallows near an unopened, still-sealed-in-the-plastic box of dryer sheets. Or else you'll end up with marshmallows that 'taste' like soap! Yum! Anne & Parsley, originally uploaded by hurrayic. This is all I could muster at the end of yet another busy week. Good, but busy. As I read through other blogs, I see that we're all in the same boat - wishing for more creative time yet having to fill home needs and new school needs right now, in this season of winding down and gearing up. 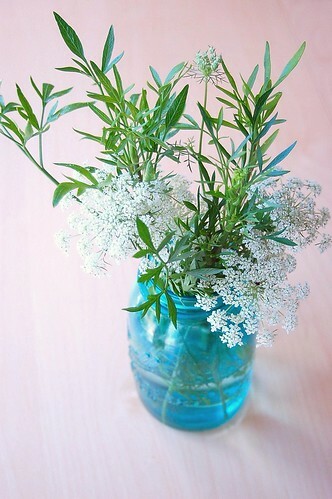 So I leave you with a bouquet of free flowers to enjoy - Queen Anne's Lace growing wild in our backyard and parsley from my flowerpot. Bug Party Fun, originally uploaded by hurrayic. ALWAYS try out a new game before the day of the party to see if it will actually work. We had a bees-into-the-beehive game all planned out. How clever we were, we thought! We blew up a ton of bright yellow balloons, some complete with silly markered bee faces. The plan was to swat (using clean fly swatters) the bees (balloons) around one hive like a bee dance and into another beehive. We imagined all these little bees swarming into the 'hive'. Well as soon as a 'bee' hit the grass, it popped! We have sharp grass, not the luscious soft green stuff you see in magazine ads and dream about. So all the little boys ended up popping the balloons, (good fun!) leaving scraps of yellow latex scattered on the lawn like extra cheese on a pizza. Look, Ma! I put my face in the water! I also drove around like mad to various dollar stores looking for goodies for my son's goody bags. I should have made more meaningful things but time was short. He's having a bug party tomorrow, so today we decorated, figured out games and made some dirt cake. Phew! I'm beat, but I did manage to squeeze in my 3rd Simplicity 3835 shirt. It's made from linen: the black is leftover from this shirt and the blue is from a pair of linen pants that I bought several years ago on the clearance rack. I didn't quite have enough blue for the sleeves, hence the black. It reminds me of a baseball shirt - it looks better on than hanging here on the hanger. I changed the proportions again and it fits much better. I'm thinking of several more - maybe one with 3/4 length sleeves for the fall/winter. Last week, we made some homemade lemonade, our second batch. Lovely. I used organic sugar so the finished resulting color is a bit darker than if I had used regular white sugar. I didn't have a potato masher, so I used my pastry blender. I based it on this recipe, but changed a few things that a friend had done. Just thinly slice all lemons - put in bowl, put sugar on top, mash it, add water. Transfer some of the lemons to bottom of pitcher, pour the remainder (through a strainer) directly into pitcher. Add ice. Good to go! ... it was good but a wee bit sour. And the next day (yes, I unfortunately left the limes in the pitcher overnight), it was totally... well let's just say it made your eyes blink uncontrollably and your mouth pucker like a shriveled prune. Maybe we should try some homemade orange juice? Edited to add: My beautiful pitcher is no more. I think I poured too-hot water in the sink (when the empty pitcher was also in there) and I heard a 'pinging' sound. It must have made two large circular cracks in the bottom of the glass. Here's a little eye candy for you; not something from a store but something better than that: goodies from our garden. Sun golds waiting to be eaten. More cucumbers and more beans! And our first big eggplant... isn't 'she' a beauty? 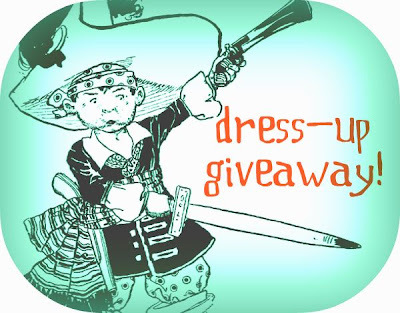 And.... Congratulations to Anja as the final winner of the Dress-Up Giveaways. Whew! It was a long month and a busy one but a good one. Thank you all who participated. It was fun and a good way to begin to declutter my house. During our tie-dyeing days, we watered the lawn with leftover colored water. 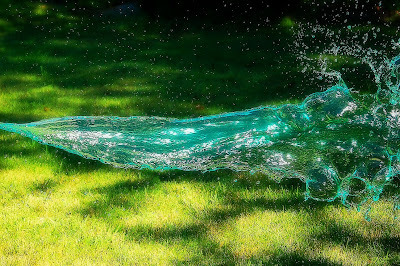 My oldest threw a bucket of this aqua-colored water, and I attempted to catch it mid-air. I think I need a lot more practice! This is one that I took on the evening of July 4th. I had my youngest run around with a lit light saber to see the colored light dance. I think it becomes more like a modern-art abstract painting. And these 'In Motion' photographs are what I received from my swap partner. Very beautiful. Thanks, Debi!